Was the March 2009 low the end of a secular bear market and the beginning of a secular bull? 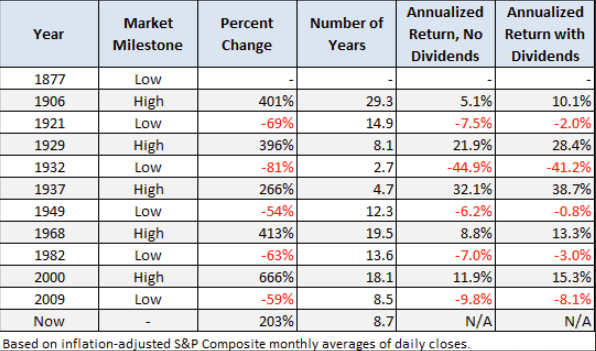 At this point, almost nine years later, the S&P 500 has set a series of inflation-adjusted record highs based on monthly averages of daily closes. Let's examine the past to broaden our understanding of the range of historical trends in market performance. An obvious feature of this inflation-adjusted series is the pattern of long-term alternations between uptrends and downtrends. Market historians call these "secular" bull and bear markets from the Latin word saeculum "long period of time" (in contrast to aeternus "eternal" — the type of bull market we fantasize about). The key word on the chart above is secular. The implicit rule we're following is that blue shows secular trends that lead to new all-time real highs. Periods in between are secular bear markets, regardless of their cyclical rallies. 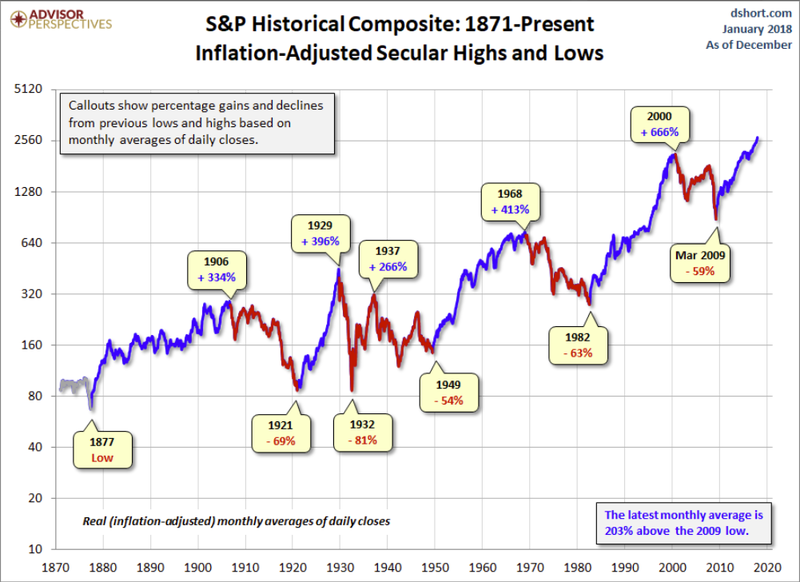 For example, the rally from 1932 to 1937, despite its strength, remains a cycle in a secular bear market. At its peak in 1937, the index was 29% below the real all-time high of 1929. For a scholarly study of secular bear markets, which highlights the same key turning points, see Russell Napier's Anatomy of the Bear: Lessons from Wall Street's Four Great Bottoms. An alternate view of secular trends is offered by Ed Easterling of Crestmont Research. See his fascinating study Understanding Secular Stock Market Cycles, which makes a persuasive case that we remain in a bear market that began in 2000. The underlying principle, in Easterling's view, is the price/earnings ratio, which remains lofty. Let's review the same chart, this time with a regression trend line through the data. This line is a "best fit" that essentially divides the monthly values so that the total distance of the data points above the line equals the total distance below. 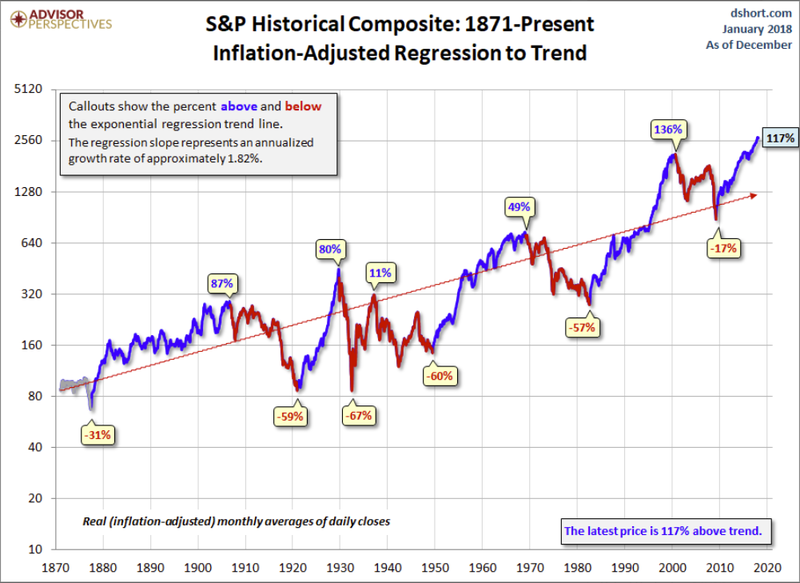 Historically, regression to trend often means overshooting to the other side. The latest monthly average of daily closes is 117% above trend. Note that in the charts above, we've color-coded the rally since the 2009 low in blue, implying the start of a secular bull. We did so because, in December of 2011, the real price achieved a new all-time high. But based on the underlying market valuation, one can make a strong case that the secular bear market hasn't ended. For a persuasive argument along those lines, see Ed Easterling's Are We There Yet? Secular Stock Market Cycle Status (PDF format). For a more optimistic view, see Chris Puplava's assertion in The Secular Bear Market in Stocks Is Over. Chris's commentary includes some interesting demographic analysis based on the ratio of the higher earning, bigger spending age 35-49 cohort to less financially empowered age 20-34 cohort. Unfortunately, this ratio is being savagely trumped by a far more powerful demographic shift: The ratio of the elderly (65 and over) to the peak earning cohort (age 45-54). The next chart, based on Census Bureau historical data and mid-year population forecasts to 2060, illustrates this rather amazing shift. Even more disturbing is the elderly dependency ratio, the label given by demographers to the ratio of the 65 and older population to the productive workforce, which for developed economies is usually identified as ages 20-64. 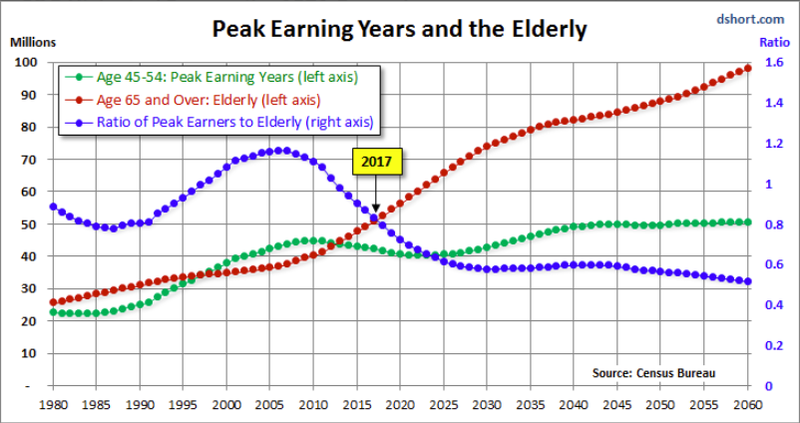 The next chart illustrates the elderly dependency ratio with Census Bureau forecasts to 2060. Note that in this chart we've followed the general practice in demographic research of multiplying the percent by 100 (e.g., the estimated mid-year 2016 elderly dependency ratio is 25.7% x 100 = 25.7). 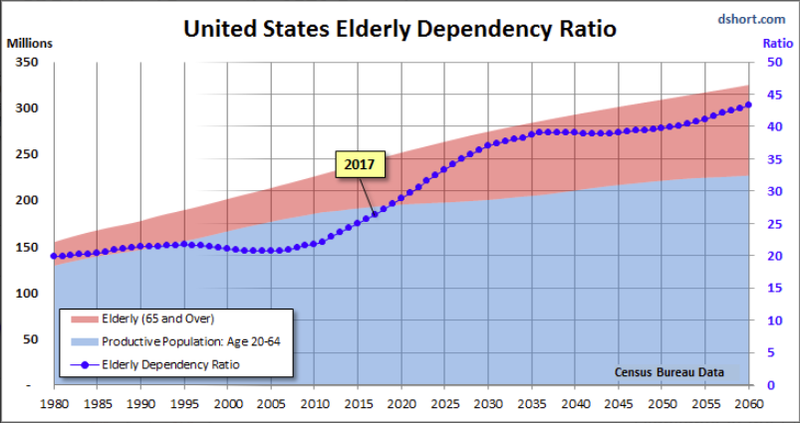 As the chart painfully illustrates, the elderly dependency ratio is in the early stages of a relentless rise that doesn't hit an interim peak until around 2036, over two decades from now. Notes: This commentary focuses on price rather than total return. For a perspective on Total Returns across this timeline, see our periodically updated Total Return Roller Coaster. 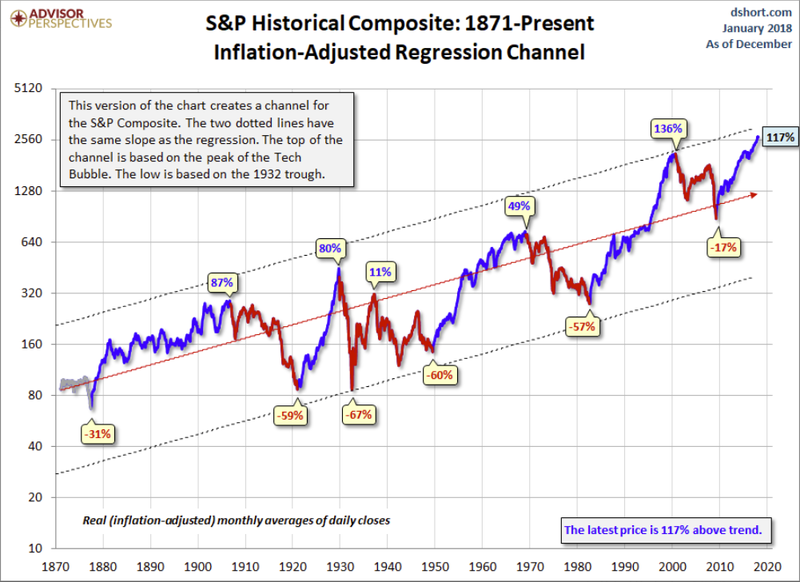 For readers unfamiliar with the S&P Composite Index (a splice of historical data different from the S&P Composite 1500), see this article for an explanation. The S&P 500 closing high in 2000 was on March 24th. But the peak for monthly averages of daily closes was in August of 2000.